Piers Morgan has trolled BBC Breakfast by running an advert for ITV’s Good Morning Britain on an electronic billboard outside the studio. Petty is as petty does, I guess. The billboard, which is outside the BBC studios in Media City, Salford, advertises GMB as ‘not your average breakfast’ and is on a rolling loop all day. BBC Breakfast host Dan Walker, who regularly has to put up with Piers’ incessant trolling on Twitter, and who this was probably directed at, replied via Twitter. I’m not sure what they’ve told you Mr Morgan, but that’s the side that no-one looks at. A magnificent example of art imitating life. I’m not sure what they’ve told you Mr Morgan but that’s the side that no-one looks at ? Peter Ruddick, who works on BBC Breakfast, and whose Twitter bio reveals he’s been called a ‘pompous ar*e’ by Morgan, took an image of what the staff could see from the window of the studio. And it was business as usual, with BBC being broadcast live. 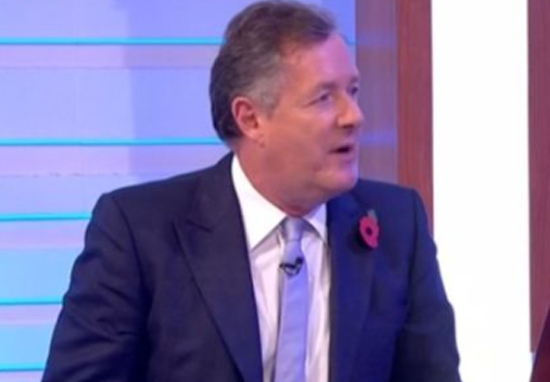 Talking about it live on GMB, Morgan seemed pretty smug about the whole thing, as you’d expect. He told viewers, as staff arrive at work, they’ll be hearing about ‘not your average breakfast’. I think it’s most likely going to go unnoticed and whether or not BBC respond, we’ll have to wait and see. Earlier this year, Morgan called out the BBC for publishing a lewd cartoon depicting him and Donald Trump. It came after the broadcaster had interviewed the US President at the beginning of 2018, which was always going to have people talking. The image was broadcast on BBC Two programme The Mash Report, during a segment by comedian, Rachel Parris, who was talking about the recent interview. Parris compared the interview to that between Richard Nixon and David Frost back in 1977, saying: ‘The staging hinted at a great intimacy between the two men’. As he complained about the use of the image, Morgan went on to post it out to his followers three times in the process, questioning how it would have been received if it were a female journalist and UK Prime Minister Theresa May. The BBC thinks this is OK to broadcast. But if it depicted high profile women, there would be outrage. Why the double standard? If the BBC broadcast an image like this after a female journalist interviewed @theresa_may – all hell would break loose & people would be fired. Gender equality shouldn’t just apply to pay – should it? As you’d expect, the image and Morgan’s tweets quickly caught the attention of people of the internet. Some agreed with Morgan, some didn’t… and some decided to just make fun of the whole thing, because, well, it is pretty funny. Whatever the stance, it made for some pretty interesting (and at times, funny) reading.